Please join the Mark Kirk for U.S. Senate campaign as we circulate petitions before the Chicago Bears game on November 1, 2015. The month of November represents the "4th Quarter" for our campaign in terms of time left to finish off the 10,000 signatures needed to get on the ballot in 2016. What better way to "kick off" the month than to go to a Chicago Bears game! Our "game plan" is to go through a few of the tailgate lots asking Bears fans to sign our petitions and help us finish our "drive!" Afterwards, we'll have our own tailgate party and provide free lunch for all volunteers! Tailgating is allowed on all surface lots in the Museum Campus; on the upper level of the Waldron deck; and in the 31st Street McCormick Place Lot B. We will meet at the Northern Entrance of Soldier Field on E. McFetridge Drive, directly across the street from The Field Museum at 8 AM and then fan out into teams to "tackle" all the lots! When we finish, we will meet back at the Northern Entrance on E. McFetridge Drive between 11:45 AM and 12 Noon. 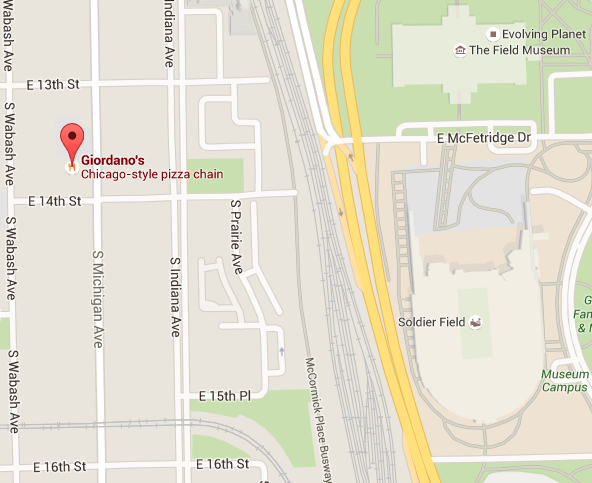 From there, we will head over to Giordano's for Lunch!